Hello. I have a few favorite games I like to share with you guys. Many of these titles are super easy to get a hold of if you want to play so no issue about rarity or none of that. This is not only for PlayStation 4 but across multiple platforms. Here are short mini-reviews. This is a visual novel/ Tactical turn-based RPG created by Delight works/Aniplex creators of the Fate/series anime. In this game, it's 2017 and human existence is going to end 2018 and the only group that can save the world is a special elite group in a base called Chaldea which consists of mages and masters. Due to the unfortunate event, you end up as the Final Master in the entire Fate Universe. You summon heroes, historical figures, folklore and villains from old to new such as King Arthur, Santa Claus, Jack The Ripper, Medusa, Hercules, Thomas Edison, Jeanne D' Arc and so many others. Each character is thrown into servant classes such as Sabers, Archers, Lancers, Mages, Beskers and more. Each class is stronger over another such as Sabers beat lancers, Archers beats sabers, Berskers beats deal 2x more damage to all servant types but in return receives 2x more damage from them. Everyone's first trusty servant Mash. 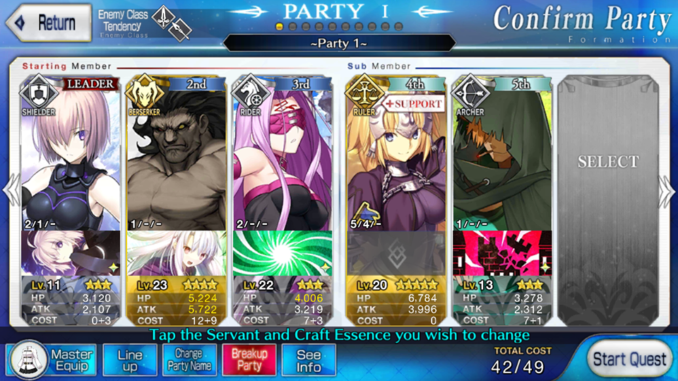 This is the party set up screen which you get your servants ready for battle. Here you have Jeanne D' Arc, Dracula, and Hercules. Dracula ultimate is ready to go which is at the top of the screen. I keep playing this game for the sheer enjoyment of it. The story is fantastic I loved the new London scenario they added to the game. It went from a sherlock holmes detective chapter into an all-out battle against Legends from history. Besides the story, I enjoy powering up my servants to handle more complicated battles that take more than just attack, attack, and more attack. Many events and challenges take strategy, party planning and good equipment to win. Once you get started it's very hard to put down. If you are wondering if people play this game online. Yes it's super active even on youtube streamers making content for the game. Ohhhh man! This game is freaking awesome! The story takes a backseat, a dragon shows up in your little village and starts setting everything on fire. You go and challenge the might of this dragon and of course he defeats you. Instead of killing the player he instead takes their heart, curses it and consumes it. If you ever want to get your heart back and live out your destiny by your own hands you must defeat this dragon to get back your freedom. There is your antagonist. The Dragon who takes your heart and controls your fate. You're accompanied by a pawn who you create, there is a lot to know about pawns but here is the short version. These guys follow the player and help them out in quests and in battles. The more quests and enemies you defeat in the game the more knowledgeable they become. These pawns can be sent out to the server where they can help out other players in their game. Once they are finished with their adventure they come back with a rating sheet which the other player used to show how your servant does in their gameplay. The player can be accompanied by a total of three pawns on their adventure. The character creation for your pawn. The gameplay is the best factor of this game. You can climb giants, bashing them/slashing them in the face to bring them down. 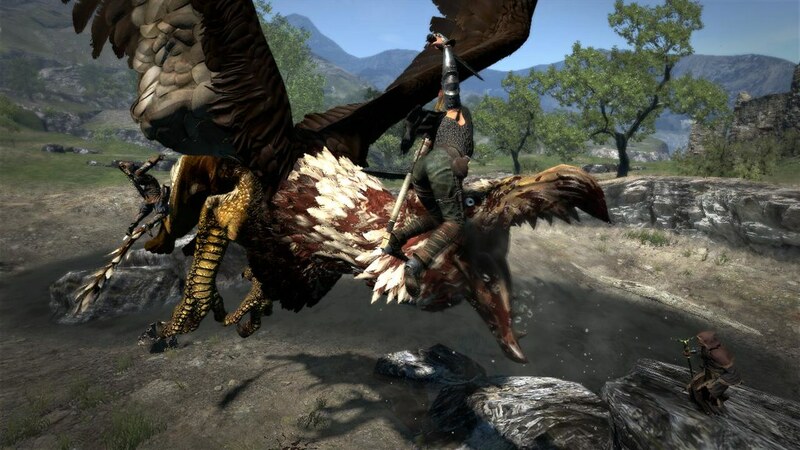 You can cling on to a dragon that took flight while fighting him at the same time hoping you don't fall to your death. This game has a vocation system where you have a mage, warrior, strider (Thief/Archer) This game nails combat perfectly, moves are stylish, does damage and fun to use. Magic is done extremely well in this game unlike hundreds of RPGs. You can summon hurricanes, meteors, create whips out of thunder, visually impressive and devastating. I personally like the Magick Archer class where you can set yourself on fire and beat the crap out of enemies or uppercut an enemy with your twin daggers thus launched into the sky and then punch them so hard on the landing that they explode. Trust me. You will hate Griffens enough to kill them the moment you see them. This Orge is about to get smashed. In this version, they have added in all the DLC (Downloadable Content) And you can access that content really early in the game by visiting the pier in the first town at night. Be wary the creatures in there are not meant for starters you have to need to be a seasoned player to stand a chance in that place. 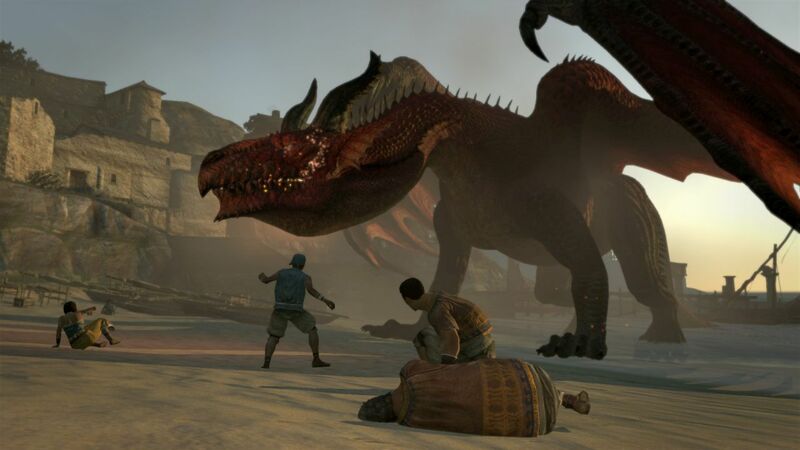 If you need a good Action RPG pick up Dragon's Dogma it's awesome! This is a high-speed futuristic racing game which the gaming market lacks real bad. Extreme G series is gone for good and the last F-Zero game was back in 2004 really not a whole lot of options here until Redout came out. This game features cool futuristic cars, crazy tracks with sharp turns, loop de loops, ramps that have your vehicle goes miles airborne. The controls are a good and they added some mechanics that seem a bit odd where you have to tilt your ship downward if you want to go down a slope faster and upwards if you want to go up a ramp without damaging your vehicle and losing speed. The races are intense and the A.I is no joke so getting to first place is going to be a challenge unless you perfect your memorization of turns, mechanics and when to use your boosters. It looks pretty but in reality, it's a freaking nightmare to race in! If you need a fast-paced racing game that gets your heart pumping. Look no further than Redout! This game has a huge cast of characters ranging from all of Koei Tecmo franchise. You have characters from Ninja Gaiden, Deception, Dead or Alive, Dynasty Warriors, Atelier series and so many others. The story takes place in a distant world where there are magic and furry creatures as the main inhabitants. In this particular world, they had a king with three children. The King died by his life force being drained and with no successor, the three children fight for the throne and try to save their world from a bigger threat that only the three know of. The candidates for the throne are Tamaki who is the youngest of the three cheerful, innocent and naive, Setsuna who is the loud charge into battle with zero plan, and will go out of his way to save people who are in trouble, then there is Shiki who is cold, calculating, small talker with a dark secret. Depending on who you decide to be your main character you will be with one of the three children forces. This is the main character selection screen. There are a ton of choices! The gameplay is a hack and slash where you can have one character fight through thousands of soldiers no problem. This is one of my favorite Musou games up to date. Koei Temco has added some much-needed improvements in the combat system like adding the ability to dodge an attack, you can swap in your other characters instantly and continue fighting as a team personally I love that feature since you can have up to a total of 4 characters fighting at the same time. 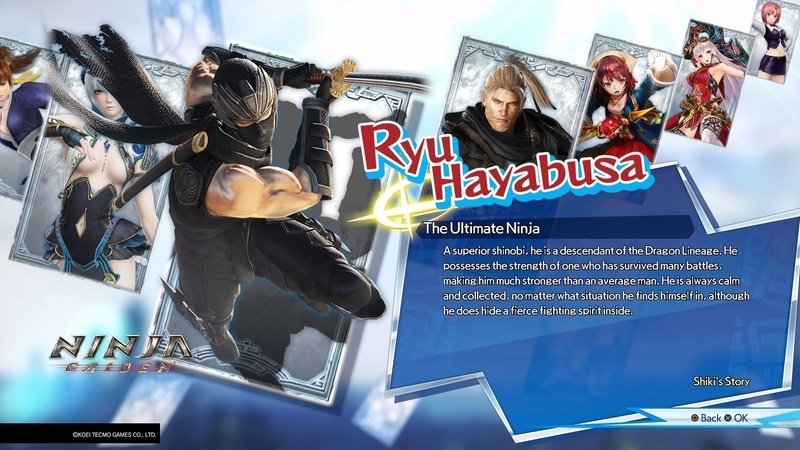 They have added special Musou attacks some of them are really great and others I honestly don't get it such as Nioh's. Another great thing I loved is the rush mode where your team cheers on how well you're beating up the enemies. 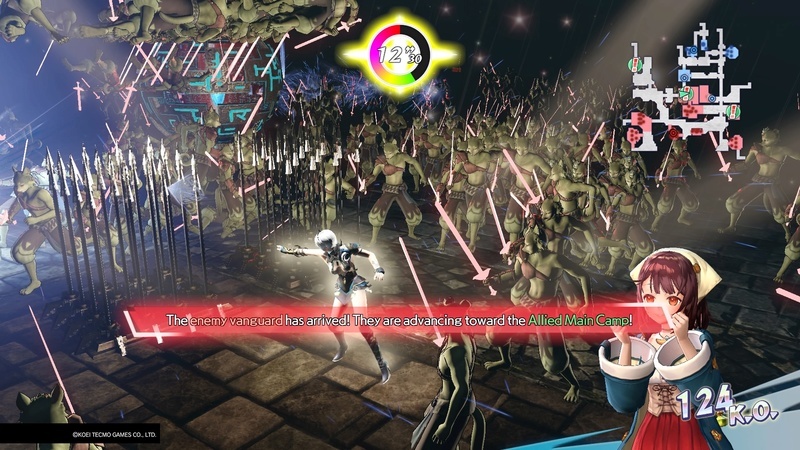 And for some crazy reason, all the enemies threw away their weapons and replaced them with Sith Lightsabers! The better you are beating them up your characters will cheer and start attacking the screen which attacks everyone one screen. You can extend the time on that mode by reaching milestones of K.O's and once the timer ends everyone does an attack that deals massive damage to any survivors. This is rush mode and only one cheerleader. Do better to get more. When you are doing good those cheerleaders start beating down the crowd. And yes, that is a giant boulder. Unlike many other Musou titles where you have a set path from start to end in this game, there are multiple endings. You can even say "screw the main story I had enough of these furry creatures barking about the forest and some spring" and decide to conquer the world instead, of course, those decisions are up to the player. My only gripe with this game is how they handled some of the challenges, for some strange reason in order for the player to succeed you need to go way out of the way in routes in order to even complete it. I found this extremely annoying due to the fact there is no horse or any type of mount you need to run there as fast as you possibly can to that destination. Other than that it's a wonderful game. Nice article dude! Yours definitely puts my upcoming one to shame! I look forward to seeing your top game of 2017! I'm not going to lie. I did not read all of that lol. Your article was more than a little too long lol. What a detailed feature @Pennsage.